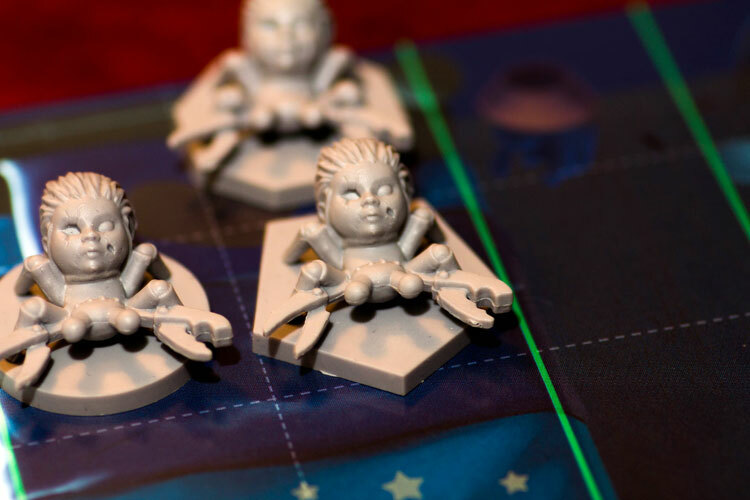 We review Stuffed Fables, a family-friendly dungeon crawler board game published by Plaid Hat Games. 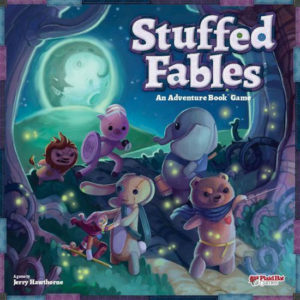 In Stuffed Fables, players take control of stuffed animals and embark on quests to protect a sleeping child. 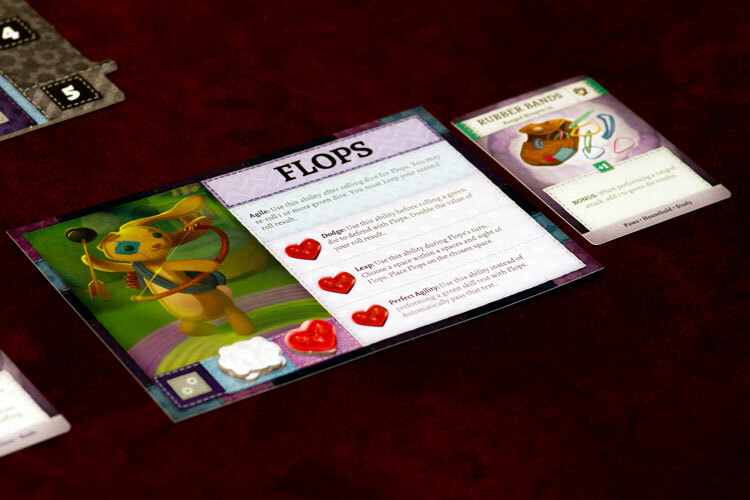 Stuffed Fables, from designer Jerry Hawthorne, is the spiritual successor to his earlier design, Mice and Mystics. The format is similar; players take the role of unconventional heroes fighting similarly strange bad guys. Rather than rodents, this time players will control stuffed animals, protecting a young girl from the dangerous minions that lurk under her bed. 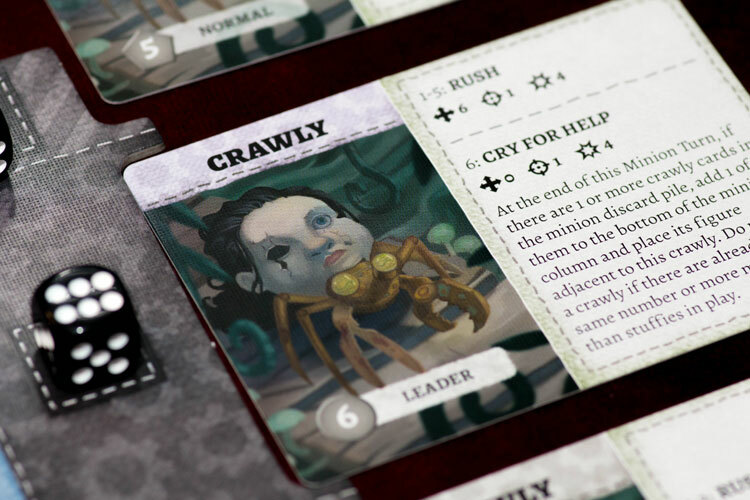 Stuffed Fables is a role-playing, dungeon crawl board game. Each chapter takes about 90 minutes and plays 2-4 stuffies. Players will take on the role of stuffies—stuffed animals belonging to a young little girl. Your job is to protect her from the minions that will try to disturb her during her sleep through the game’s various chapters. On your turn you will draw dice from a bag and use those dice to take actions. Each die color is associated to a particular action. Red for melee attacks, yellow for searching, blue for defense, etc. You must choose what you are using your dice for prior to rolling them, and then roll to see if you succeed. Dice of the same color can be rolled simultaneously to make it more likely you will pass the check. Each character has their own set of special abilities. There are also black dice in the bag that represent the minions. When a black die is pulled from the bag it, is added to the minion track. Once there are minion dice equal to the number of minions, they will all activate and potentially attack the stuffies. Also mechanically straightforward, the game really relies heavily on the story elements. Each chapter has a long introduction that explains the next story in the young girl’s life and the role the stuffies are playing. The storybook doubles as the game map, so there are no tiles to dig through to get the game up and going. Some spaces on the map also trigger new story elements or random encounters with other toys, adding to the thematic flair. When a player takes damage, they lose stuffing from their character. If they are out of stuffing, they collapse immediately. Players can lose if all of the stuffies are collapsed simultaneously, although it is unlikely. The stuffies will almost assuredly make it to the end of the story, although the chapter can take a slightly different route depending on the success of the players throughout their adventure. Minions of discarded toy parts attack you and your band of stuffies. The storybook in Stuffed Fables is really at the heart of everything that is right about this game. The narrative story, while not exactly a thrilling piece of literature, is written at an appropriate level for elementary school aged children. One of my biggest complaints of dungeon crawl style games is having to find the right tiles to set up the board. Having the map just be part of the storybook is a great idea that makes getting Stuffed Fables to the table that much easier. Random encounters can occur throughout the chapter, presenting a choice for the players to make. The chapters are replayable and do have some branching paths based on some of your decisions or outcomes. A full chapter takes at least 90 minutes to play. There isn’t a great way to save your progress mid-chapter, but with enough plastic baggies and dedication, you can try to put a game on pause if needed. 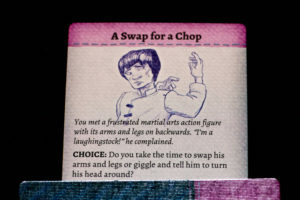 There is a bookkeeper token that passes around the table that designates both the first player and who should be reading the passages from the book when needed. This is a great idea when playing with older children—I’m a big fan of using games as educational tools, especially when kids won’t even recognize it. The gameplay itself is fairly easy. With the exception of a few boss fights, each minion only takes one hit to defeat. However, if your random dice pulls are against you, it can go slower than you might hope, but it takes some real unfortunate events for you to actually lose. This is probably a feature rather than an issue, as Stuffed Fables is really about enjoying the story. That said if you are hoping for a challenging cooperative game, this isn’t it. The minions activate when a dice has been drawn from the bag for each minion on the track. The biggest concern I have about Stuffed Fables is really the range of ages which the game actually works with. The story is geared toward younger kids—the first scenario is about the young girl moving to her big girl bed. The ruleset, unfortunately, is a little complex for kids in the 3-5 years old range. My 4 year old son was able to play with a lot of assistance, but it felt mostly like I was dragging him through it. Older kids won’t really connect with the story and the mechanisms aren’t deep enough for this to work with your normal game group. As an adult playing with your children, it can be enjoyable to kind of role play your characters and get into the story. Otherwise it really isn’t going be a rewarding experience for teenage children or adult gamers. Are you a family gamer with children between about 6 and 10 years old? Stuffed Fables may work for you and your kids. It can certainly be thought of as a children-level dungeon crawler. As an adult, the game isn’t particularly engaging, but can be fun to get your kids really into the story. If you think your children would like more of a storybook game—or you want them to get some reading practice, Stuffed Fables will do that. But it just isn’t going to be fun for everyone at the table. Final Score: 3 Stars – A good game for the right aged kids, but that window is small. • Wonderfully produced storybook with a kid friendly story. • Miniatures are great looking and the stuffed animal theme is neat. • Gameplay is a little boring; it’s more about playing the characters. • Ruleset is too complex for younger kids to play on their own. Great review and sounds spot on. I’m intrigued by the game but sounds like I should pass. I’m particular concerned whether the violence ends up being a mixed signal at the ages where this game is appropriate.